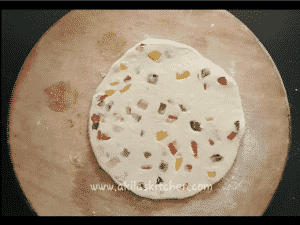 Capsicum Cheese Paratha | how to make capsicum cheese paratha – a step by step and video recipe. 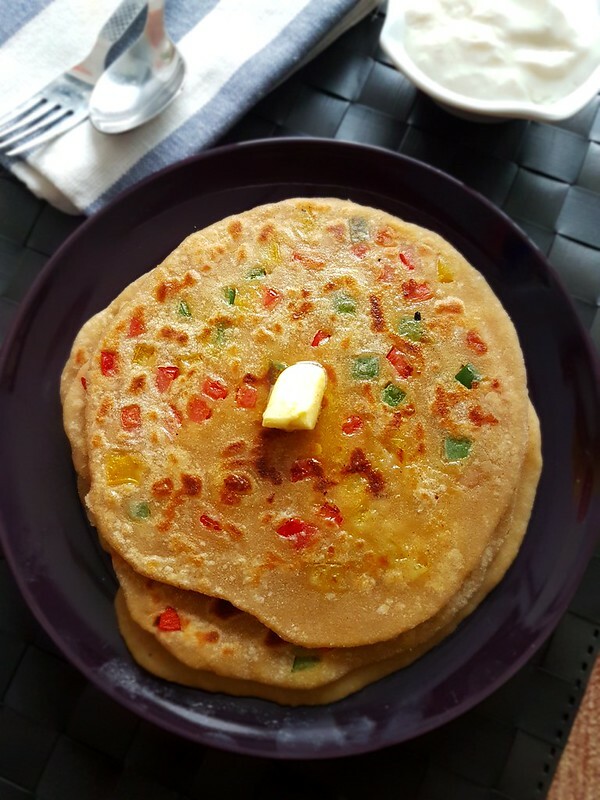 Capsicum cheese paratha is one of my favorite Paratha recipe after I started making different Parathas at home. 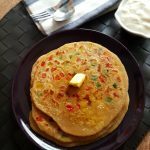 This capaicum cheese paratha is made up of different colored capsicums and the cheese which makes it – a kids friendly recipe and I bet your kids surely fall in love with this Paratha recipe. 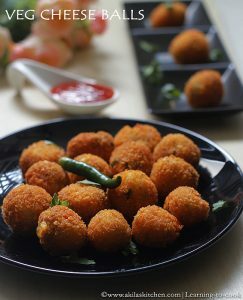 The main ingredients capsicums gives the crunchy taste to this and the cheese makes them even more yummy. 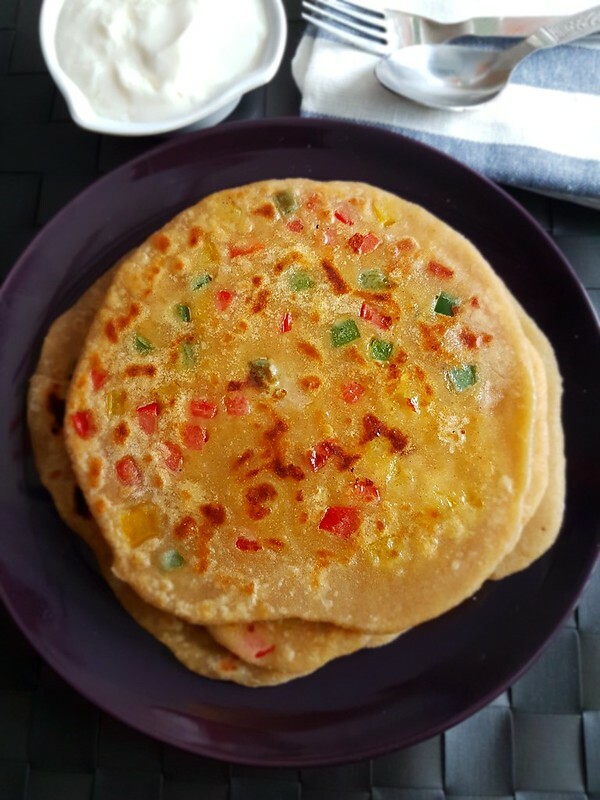 I can say, that not only kids but also people of all age groups definitely will fall in love with this Capsicum Cheese Paratha recipe. This Paratha can be packed easily and given to kids as a lunch box recipe and you can even prepare and serve for the dinner. Actually, these capsicum cheese paratha does not require any side dish. A simple curd and pickle is enough. But if you want, you can try the side dishes like – matar paneer, baby corn masala, soys chunks masala, mushroom masala and some raita recipes like – mixed vegetable raita, bell pepper raita, mango raita, aloo raita which goes very well with these paratha. 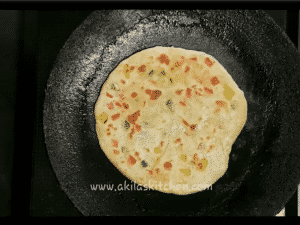 Let’s see the procedure of Capsicum cheese paratha | how to make Capsicum Cheese Paratha. 1. 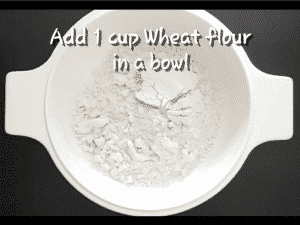 In a bowl add 1 cup of wheat flour. 2. 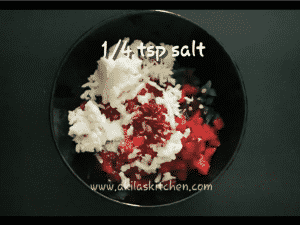 To this add 1/2 tsp of salt and 1/2cup water little by little and start kneading to make a soft dough. 3. While kneading add 1/2 teaspoon to one teaspoon of oil and also add some water if you want and knead again. 4. Allow to rest for 20 to 30 minutes. 5. 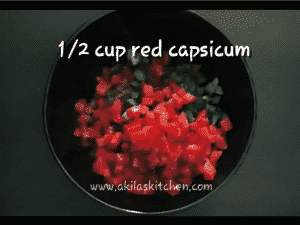 Meanwhile in another Bowl add 1/2 cup of yellow capsicum, 1/2 cup of green capsicum and 1/2 cup of red capsicum. 6. To this add one cup of mozzarella cheese or cheddar cheese and 1 tsp of chilli lakes and 1/4 teaspoon of salt (or add salt as required). 7. Mix everything well and keep it aside. 8. Now after 30 minutes take the resting dough and slightly knead again and make into equal sized balls. 9. Add little flour and dust it and flatten the ball slightly. 10. 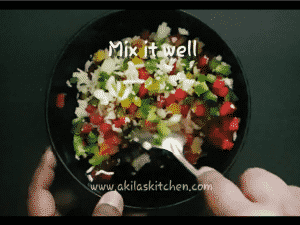 Add 1 tbsp of the capsicum cheese mixture and place it in the middle. 11. 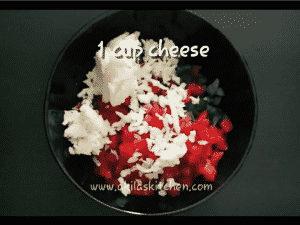 Again make round balls carefully, so that the cheese mixture is fully closed. 12. Again flatten the paratha and dust with some flour whenever needed. Do not make it very thin. 13. 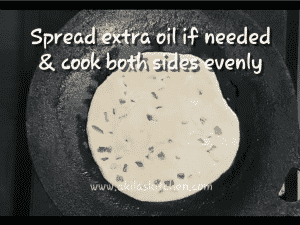 In the dosa tawa or flat pan, add 1 tsp of oil and spread slightly. Add the paratha and let it cool till it becomes light brown colour. Add some extra oil around it, if needed and cook in medium flame. 14. Slightly press them so it is cooked evenly. Flip to the other side and let it cook evenly on both sides. if needed add 1/2 teaspoon of oil. 15. Tasty and yummy Capsicum cheese paratha is ready. Serve it with butter, pickle and curd. 1. 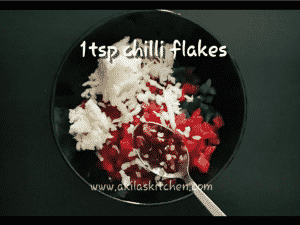 If you want you can add red chilli powder in the filling instead of chilli flakes. 2. Do not compromise in the cheese because the cheese gives really extra flavor. If you want you can add more cheese also. 3. Adding colored capsicum makes it more appealing when given to kids. 4. I used mozeralla cheese. You can use normal cheese also. 5. You can add coriander leaves or herbs like oregano or basil for extra flavor. 6. 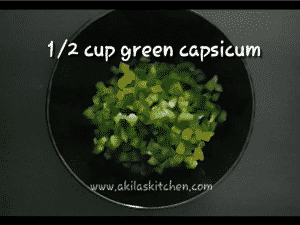 People with more health conscious, please avoid this recipe. 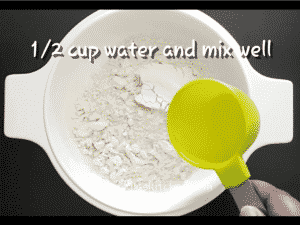 In a bowl add 1 cup of wheat flour. 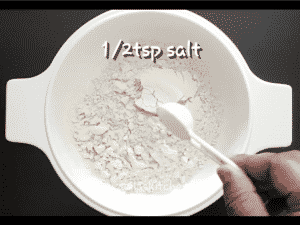 To this add 1/2 tsp of salt and 1/2cup water little by little and start kneading to make a soft dough. While kneading add 1/2 teaspoon to one teaspoon of oil and also add some water if you want and knead again. 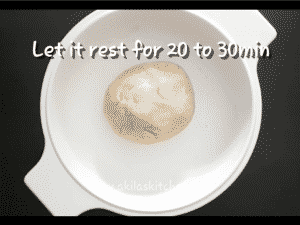 Allow to rest for 20 to 30 minutes. 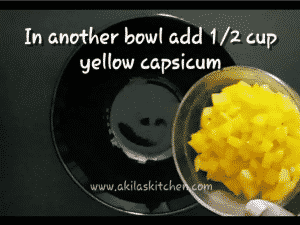 Meanwhile in another Bowl add 1/2 cup of yellow capsicum, 1/2 cup of green capsicum and 1/2 cup of red capsicum. To this add one cup of mozzarella cheese or cheddar cheese and 1 tsp of chilli lakes and 1/4 teaspoon of salt (or add salt as required). Now after 30 minutes take the resting dough and slightly knead again and make into equal sized balls. Add little flour and dust it and flatten the ball slightly. 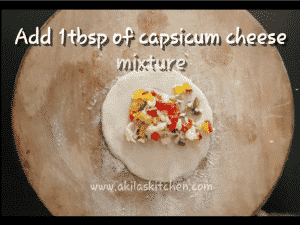 Add 1 tbsp of the capsicum cheese mixture and place it in the middle. 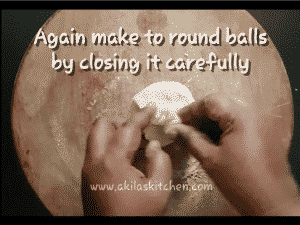 Again make round balls carefully, so that the cheese mixture is fully closed. Again flatten the paratha and dust with some flour whenever needed. Do not make it very thin. 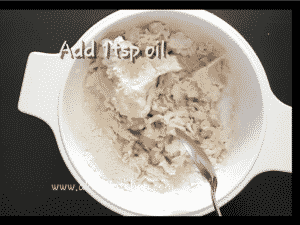 In the dosa tawa or flat pan, add 1 tsp of oil and spread slightly. Add the paratha and let it cool till it becomes light brown colour. Add some extra oil around it, if needed and cook in medium flame. Slightly press them so it is cooked evenly. Flip to the other side and let it cook evenly on both sides. if needed add 1/2 teaspoon of oil. Tasty and yummy Cheese chilli paratha is ready. Serve it with butter, pickle and curd.